Menorca holidays are a hot spot for families travelling with children. Quieter than its Balearic sisters, Majorca and Ibiza, Menorca is an idyllic island that's perfect if you're looking for a laid-back Spanish holiday that’s more about siestas in the sun than the fiestas after dark. Thanks to its relaxed nature, Menorca is a popular spot for fun-loving family holidays, chilled couples retreats and individuals who want to get away from it all. Better still, the year-round Mediterranean sunshine means this Balearic beauty is a great destination for summer holidays and winter sun escapes too. We’ve had a good rummage through some of the Menorca all inclusive hotels, apartments and resorts that are available on the island and picked out five that top the child friendly reviews. So if you're planning a fun-tastic family holiday in Menorca, check in below and also grab our pocket guide to the Balearics to find out more about Menorca before you fly! Featuring colourful self-contained apartments, the Menorca Sea Club complex is a great choice for families looking for a relaxing break, and can be found on a cliff-top right by the beach and close to town. Its landscaped gardens and three outdoor pools offer perfect places to kick back and chill out, and there’s a small playground to keep the kids happy. Local shops and restaurants are about a 15-minute walk away, but there’s a restaurant and bar onsite if you don’t wish to venture out every day. Situated in the modern, chilled out resort of Cala’n Bosch, the whitewashed Menorcan-style Roc Lago Park apartments offer guests a convenient location to base themselves in this beautiful part of the island. The sandy beach and natural harbour are just steps away, while the accommodation itself – built to resemble Mediterranean bungalows – is comfortable and well-equipped. The complex also includes 2 pools, buffet restaurant, café bar, sports and activities, and a kids’ animation programme. Plus, it’s extremely close to the Aqua Rock waterpark too, so kids don’t have to venture far to enjoy a fun-filled day out! Considered by some to be in the resort of Cala’n Forcat, but also extremely close to Cala Piques Beach, the traditional-style Globales Hi! Binimar offers a perfect place for families for all sorts of things to do in Menorca. Days can be filled with as little or as much activity and entertainment as you wish, thanks to the fantastic facilities available, and the choice of pools is perfect for water babies – it even includes a fun-filled aqua-play area for the kids, with three slides for a splashing good time! There are also several eateries onsite, including buffet and a la carte - plus bars and a kids’ club. The beach is just 300m away, so you can sneak out whenever you wish. With Cala Blanca beach just 100 metres away, and plenty of facilities onsite to keep every guest happily occupied, the Globales Mediterrani is a fabulous holiday choice for anyone hoping to enjoy a modern and comfortable break. All rooms boast a smart, modern style, and most offer stunning sea views. The free-form pool is a showstopper, and the busy activities and entertainment programme keeps guests busy if they can stand to step away from the sunloungers for a while! You’ve also got a beautiful sandy cove just across the road. The all-inclusive option ensures every guest can enjoy the peace of mind of knowing that they don’t have to spend a penny onsite – not even on ice cream for the kids! Among Menorca all inclusive hotels, Globales Almirante Farragut is a 4* half-board and all-inclusive hotel that offers guests a peaceful getaway, which can also be livened up with plenty of outdoor activities and the entertainment programme that kids will love. There’s a huge split-level pool, and all rooms have been recently renovated in immaculate modern style. The winding streets of Ciutadella are within easy distance, and the beach is only a three-minute walk away if you or your kids would like to spend more time on the sands. We particularly love the beautiful sea views at this hotel, which are unobstructed thanks to its clifftop position. With several of these hotels offering world-class accommodation and wonderful facilities for kids, a Menorca vacation will be certainly memorable for families with kids. Go splash in a waterpark, play on its many golden sand beaches, take a joy ride on horseback or explore the forts and castles in this lovely Balearic island, there is a lot to entice the kids in this beach destination. There are lots of beautiful family-friendly beaches that count as best beaches in Menorca, but one of the best places to head for sun-soaked days making sandcastles from the clean, golden sand and paddling in the shallow seas, is the beach at the pretty, purpose-built resort of Cala’n Bosch. Not only is the beach a top destination for a family day out, there’s a great choice of restaurants in the marina and fun family attractions including the popular Aquarock water park nearby too. 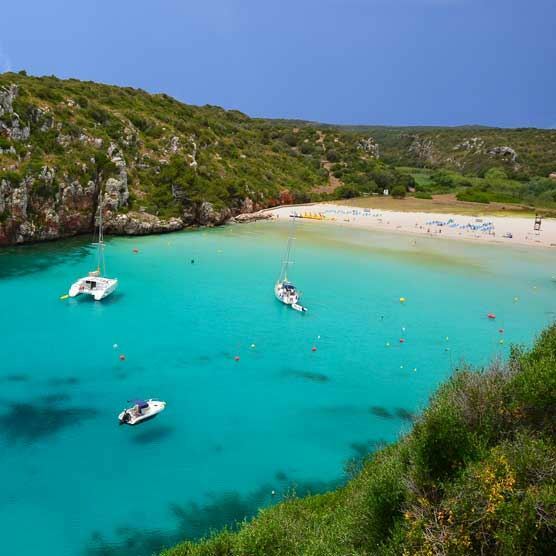 March is the best time to visit Menorca, so you can escape peak season and enjoy a sunny holiday on squash-less sands!